Tuesday was officially the first day of school in our area. I really didn't think I'd get that emotional when I saw Leyton off on his first day. Only because last year he attended 4k which he still rode the bus to and from school and was gone for the morning. So I had gone through all of it already. Last year at this time I saw an unsure and shy little boy climbing up those bus steps and sitting amongst other equally unsure kids. This year he was completely different. He knew the routine...and as if he almost didn't need my guidance. That is when the tears came in. I saw this little boy in a years time become so confident. Oh, how I love and cherish this kid. He is seriously a gentle soul and I'm so proud to be his Mommy! snif-snif...(wiping the eyes). So, I found this picture of Leyton taken when he was 2 years old last week going through some old files. 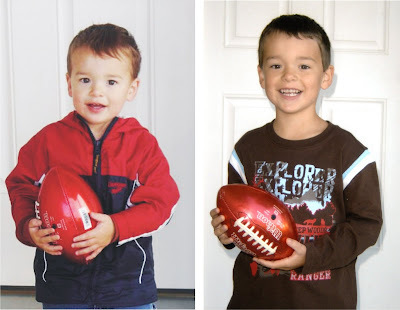 I thought how fun it would be to have him stand with his red Wisconsin Badger football for a first day back to school photo. I'm hoping to do this for every new school year as long as he will let me. Again...snif-snif!! !